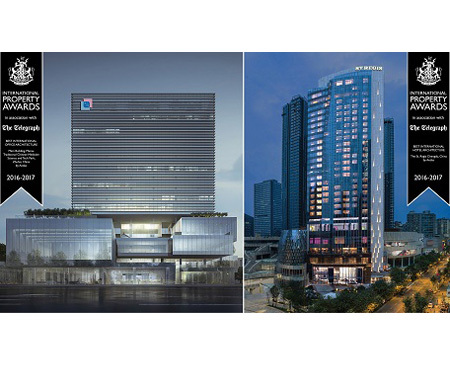 Competing against projects from Europe, Africa and the Americas, Aedas-designed Main Building of Guangdong, Macau Traditional Chinese Medicine Science and Technology Industrial Park in Zhuhai and The St. Regis Chengdu, both in China, was named the ultimate world’s Best International Office Architecture and Best International Hotel Architecture respectively at this year’s International Property Awards held in London. Located on the Hengqin Island in Zhuhai, the Main Building of Guangdong, Macau Traditional Chinese Medicine Science and Technology Industrial Park will serve as a headquarters with rentable offices, an exhibition centre, a business incubation centre, a service centre and more. Designed by Executive Director Leo Liu, it is envisioned to be a sharing platform for scientific research and development of traditional Chinese medicine, as well as cultural displays. The St. Regis Chengdu forms part of the Evergrande Huazhi Plaza, a large scale mixed-use development located at the heart of Chengdu designed by Executive Director Ed Lam. All buildings within the development reveal elements of the natural landscape of Sichuan. The unitised glass curtain wall of the hotel expresses movement and verticality, while the granite cladding shows pride and firmness. The combination transforms the hotel tower into an architectural metaphor of mountain and waterfall. MOKO in Hong Kong, also designed by Ed Lam, was named Best Retail Architecture in Asia Pacific.